Many people remain unaware of it, but the way in which you store your cannabis has a substantial effect on the quality and potency of your herbs. It is not so much of a concern for small-time buyers, who purchase little more than a few grams of bud at a time. But for those medical patients, growers and bulk recreational buyers, whose herbs are often stored for weeks or even months prior to use, learning how to store cannabis effectively could be very worthwhile. Storing your cannabis in optimal conditions helps to maintain the quality of your buds, and can even improve it with through curing over time. Make sure you have addressed each of the following factors and your cannabis will stay stronger, more pungent and more potent for longer. These are the key factors to take into account when considering how to store your cannabis. Each must be controlled to ensure maximum quality, flavor and potency of your herbs. CONTAINER MATERIAL – It’s no secret that some materials impart more ingredients into the surrounding environment than others. Take plastic, for example, which we use to store just about everything. When storing you herbs in a plastic container, minute particles of plastic will mix with the herbs, ultimately ending up being inhaled through your lungs. Glass, on the other hand, is a much harder, less porous material, which can be safely cleaned at a substantially higher temperature. Not only that, glass is odorless, meaning that it will leave the sweet smell of your marijuana untainted. DIRECT LIGHT – There are varying opinions on how much direct light exposure affects the quality of your cannabis, but it is scientifically accepted that the presence of light degrades the quality of THC on your buds. 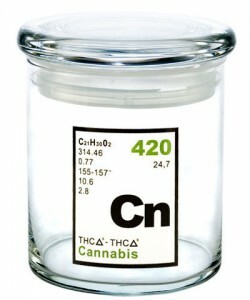 If you are planning on storing you cannabis for an extended length of time, be sure to either store your container in a cupboard, or purchase a bio-photonic glass jar to filter out harmful UV rays. HUMIDITY LEVEL – The relative humidity (RH) level within your container will also influence how your cannabis changes over time. If you feel like your herbs are too moist, or too dry and falling to dust, you can stick a Boveda pack in your container to regulate the humidity level. The packs come in a variety of RH levels, allowing you to find a humidity level that you’re happy with. Optimizing the RH level will enhance the freshness, color, flavor and potency of your herbs.